If Nicola Daley’s Hedda is a victim, in Richard Eyre’s version first seen at the Almeida in 2005 and here directed by Amanda Gaughan for the Royal Lyceum, she is a victim not of society or her position in it, but of her own cruelty. And for that, she can blame General Gabler, whose portrait dominates the stage. Found on stage as the audience enters, sleepless in the crease of a sofa, Daley gives an intense, breathtaking performance that is fully aware of the irony of her situation. Twitching, convulsed and cold in Hedda’s private moments, she finds warmth even in her austerely cruel beauty in her public ones. Simon Wilkinson’s lighting helps emphasise this fluctuating persona, lighting the grey-greens of Jean Chan’s set as if it was a landscape, moving between sun and shade. Chan’s costumes are fully realised Victorian garb for the most part, but giving Hedda (and Jade Williams’ Thea Elvsted when she is waiting for Loevborg) an asymmetric cutaway corsetry that accentuates the strictures but acknowledges their freedoms. Lewis Hart is a bumbling, bemused George Tesman, utterly at odds in his dangerous wife’s shadow and so clearly a match for Williams’ precious, fussy Thea. Jack Tarlton finds the danger and sensuality in Loevborg in a performance that moves perfectly from calculating control to the despair of a drunk who has lost his taste for alcohol. 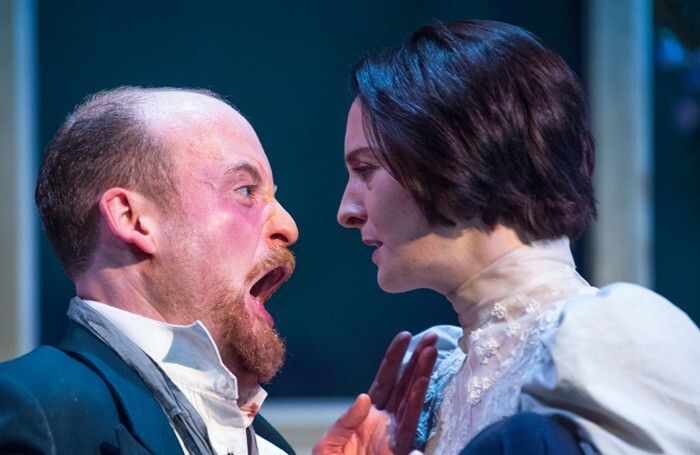 Gaughan finds the humour and pleasurably articulate playfulness of Eyre’s adaptation, moving it convincingly between realism and making it all the more chilling when Benny Young’s controlling Judge Brack convinces that his final victory would be forever.